It has been a wonderful holiday break! Ben and I both got sick, but it was kind of nice to do nothing and hang out in jammies all day. 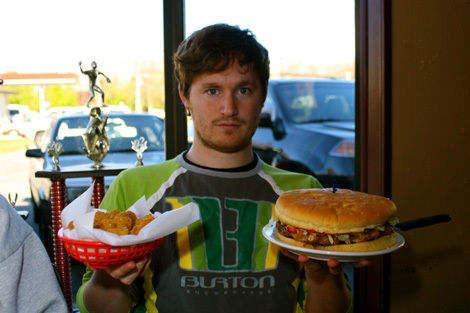 We did feel well enough to go to a few movies, and to try out a local restaurant called Big Jud's - home of the 1 lb hamburger (as seen on Man vs Food)! Delicious! We forgot our camera, but I found this guy's online... gives you an idea of the size. And... today, 3 months and 14 days after our inital offer was submitted, we got a counter offer from Bank of America on our short sale! Within a couple days we should know for sure if we will be becoming homeowners. In preparation, I've been spending a lot of time on design sites looking over paint colors. That is one thing we would like to get done before moving in, at least in the rooms that it would be a huge pain to paint later. For inspiration, I love checking out blogs and design sites. I then take the ideas and play with them at Polyvore. What a great site! Perfect for people like me who have a tough time visualizing how things will work together in a room. I also put in an order for what I hope will be over $100 worth of free Urban Decay make up. OK, now for the '"Here's How!" section. I visit Slickdeals.net at least daily and watch for sales. When I noticed a hot deal on shoes at 6PM.com, I picked out some I wanted. I checked the prices on Ebay and found that the shoes I had my eye on at a price of $17.97 were selling on Ebay for at least $26.99. So, I bought 2 pairs for me and 4 pairs in common sizes for Ebay. After my auctions finished today (all selling for at least 26.99 plus 9.99 shipping/handling), my shoes ended up being free. I have been checking Haute Look for about a year but never jumped until today- Urban Decay make up for $2.00 a piece. I love Urban Decay's brilliant pigmentation and lasting power, but can't afford to buy it normally. I picked out several for myself and for gifts, and several to resell. (On Ebay, the mascaras posted above sell for ~$7). My goal is to sell enough to make the pieces I keep free. 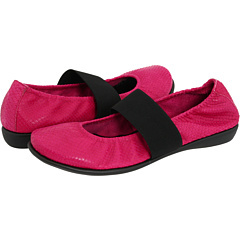 6PM.com and Haute Look are online brand name/ designer discounters. I highly recommend checking both out. No More Rack is a new one, and using this link you get $10 credit when you sign up, plus items are only $2 to ship- so sign in and get something for free! This was my first time attempting this, so I am quite proud of myself. Anyone else have an Ebay experience? Or have you picked up any hot deals recently? lEach year growing up, my Dad would make a special Christmas breakfast reflecting our heritage. 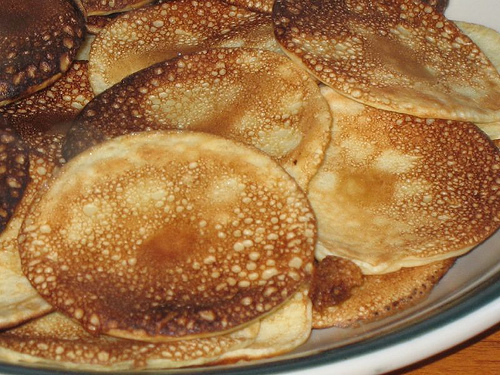 We all look forward to this special treat of a breakfast that only comes once a year- Swedish Pancakes (aka Pletts or Plätter). These darling little pancakes are heavenly! This year I am celebrating Christmas in my new family, so Dad graciously passed down his special family recipe. Add liquid to dry ingredients and beat until smooth. You'll need a special cast iron Plett pan to cook these. Amazon sells the Norpro version for 16.99 with free Super Saver Shipping. 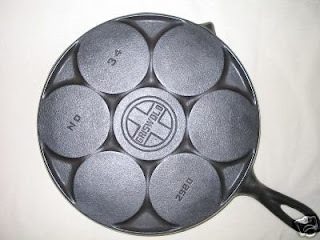 I went ahead and purchased mine on Ebay - a classic Griswold 34. These are heavy duty, and as is the case with most cast iron pans, will last for generations. I paid about $30 with shipping. Heat the pan up over low heat. It is hot enough when drops of water sprinkled on surface dance in small beads. 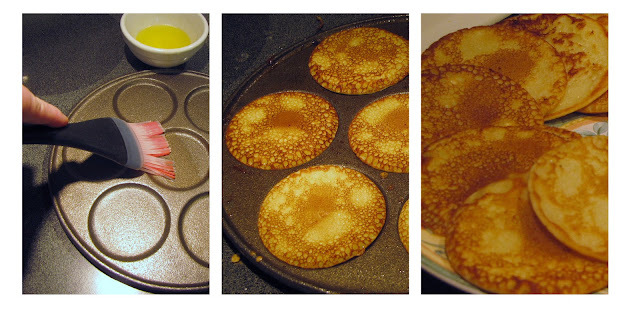 Brush with butter, then put about 1 tablespoon batter in each circular depression. 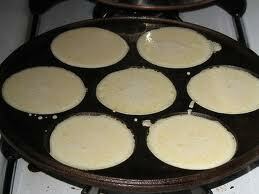 Cook batter over medium heat till golden brown, flipping once. Flipping can be a bit of an art form- some people use toothpicks or chopsticks, I use a fork and spatula combination. Keep an inverted plate or bowl over your pletts as the pile up to keep warm (and avoid people pinching them!) until you're ready to serve. 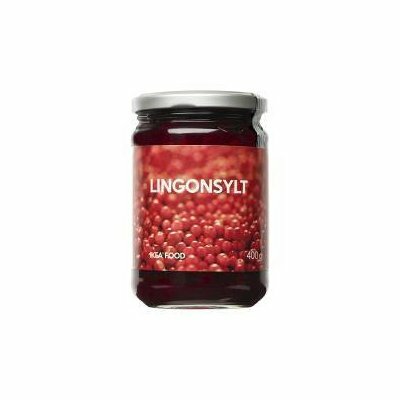 The traditional Swedish topping is Lingonberry preserves. I have had luck finding this at World Market and Ikea. 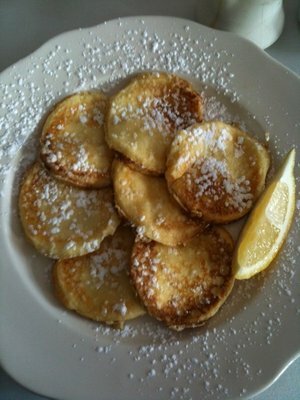 You can also, of course, use maple syrup, butter, or a sprinkling of powdered sugar. My favorite topping is cherry preserves. Enjoy! At the risk of prematurely releasing present info, we're going to share this cute present idea, which we found (of course) on a blog- Homemade by Jill. Rootbeer samplers can be purchased online, but it is a lot more fun (and cost-effective) to make one yourself! Perfect for men or someone who already seems to have everything. We collected rootbeer varieties from the local grocery stores, and were having a hard time finding unique flavors. Jill recommended Whole Foods as a rootbeer source, and they do have some wonderful options. Additional varieties can be found at Cost Plus World Market, some Albertsons (in the refrigerated single drinks section by the cheese and deli), and we found some awesome Idaho root beers at a little store concentrating in locally-produced products and produce. We ended up with 9 varieties and purchased 6-8 packs of each. We made 6 gifts total and saved on the packaging by recycling cardboard boxes. A thrift store paper cutter sliced brown grocery bags and newsprint for filling. Ben cut brands, info blurbs, and pictures off of the rootbeer packs and pasted them to the boxes for color and interest. While I love how colorful previous bloggers got with Powerpoint and making a sampler guide, I went with a simple and easy Word document, gleaning descriptions online. We then wrapped in plastic wrap (next time we're going for a more opaque wrap) and tied with twine or a bow (depending on the recipient. Ben and I began our home search in August. In Boise, the housing market has crazy low prices. It seems that 90% of homes are the market are either REOs (foreclosures) or Short Sales. Combine these deals with low interest rates, and it seemed like perfect timing. We started out with a budget of $60k, looking at townhouses and condos a little bigger than our current apartment. As is often the case (if you watch House Hunters) our budget began to expand. There were a few options in our range, but I began to worry about if there would be enough room for kids, location, etc. After meeting with a loan officer, we found that we were approved for more - $150k. Thus, our budget grew to $100k. Houses in this price range looked a lot better- now we could afford more locations, 1800 sf, and a small yard. Then we met Charter Pointe- a way south Boise neighborhood with a little extra drive time, a community pool, and tons of foreclosures. We found a 3100 sf home in need of some cosmetic repairs for $117k. We took a few days to research this huge decision, looking at neighborhood comparison sales and talking to our parents. We put together an offer of $107k, only to learn it sold the day before at $110k. Armed with our new knowledge and ready to make a quick decision, we checked out some other Charter Pointe homes. The first had a CRAZY floorplan- the front door opens to the kitchen (!? ), which led to the dining nook and living room. The master suite was also downstairs. Upstairs, there was a HUGE living area, big enough to play basketball in, 3 bedrooms, and a laundry room. The price was right- a foreclosure for 109k for 2700 sf, but we couldn't see beyond the wacky plan. Next, we saw a home in Meridian that was in a cute neighborhood, no HOA fees, 3bd, 2 bath, 1750 sf for $119k. It had granite everywhere, a garden in the backyard, and a really cool master suite. Ben fell in love, but I was worried about the space. We run two businesses- Sorella Bella and Parker Planners - which means a lot of inventory needs storing. I hesitated, and the house went pending with three offers. We decided to look at a house called Mossywood in hopes it might drop in price. Charter Pointe, 139k, 4 bd, 3 bath, 3555 sf. The day before we went to see it, it dropped to 134k. We instantly fell in love with the spacious interior- an exercise room, living/dining room, family room, huge walk-in pantry and large kitchen, and office downstairs. Upstairs were 3 bedrooms, a large game room, and a master suite with His & Hers walk-in closets and a spa tub. Ben kept saying "This is too nice for us." I agreed- it was well above our original budget, and we certainly didn't need so much space in a first home. After getting back to our apartment, though, we kept thinking about that house. We crunched the numbers and realized that it was actually within range. We put an offer in the next day and it was accepted! The spacious kitchen and huge pantry (see the door on the right edge of the photo?) are the biggest selling points to me. The one snag- it is a short sale! The offer was accepted on September 15th and moved into the second stage October 28th. Short sales can take up to 6 months to close, and we are struggling with patience. As the months go by, I am beginning to doubt our decision. Should we really take on such debt in this economy? Am I settling with the cons of the home (cookie cutter builder neighborhood, no fireplace, blah kitchen, location, tiny backyard, no 3rd bay in garage, price is max of our budget meaning little left over for decor and personalization), when the perfect home is just around the corner? This weekend we are headed out on the house hunt again with our trusty realtor. Steve has put up with us viewing dozens of homes, often twice, as we learn what we like and to spot a good deal. We are going to see two smaller fixer foreclosures with much lower price tags, and another Charter Pointe short sale (Steve- "Haven't you learned your lesson?"). Most likely there is no perfect home on our tight budget- we will need to make concessions somewhere- size, location, condition. But where? Would I be happier in a smaller, perfect condition home in a mediocre location? Or a large fixer in a good location? Maybe a small fixer in a perfect location? While I expected to learn a lot buying a house, I never knew how much I would be learning about myself! I'd love to hear your experiences about buying your home, concessions and decisions, or have you found your dream place? Final installment! These are more of the companies I have signed up with. They are not higher on the list because they offer fewer shops or less fun shops, but still good to sign up with if you get serious about mystery shopping. You never know when a company will land a new client in your area. 11. Bare International - Airport shops, Restaurants. Nationwide, US only. They don't have many shops in Idaho, but I really loved the restaurant shops while I was in Utah. I also sign up to do airport shops any time I travel. 12. Amusement Advantage - Zoo's, Mini Golf, Arcades. Nationwide, US only. These tend to have very detailed and long reports, so I recommend only signing up when there is a bonus attached. The website is a little ghetto and they never send emails. They post shops toward the end of the month. After you request, you have to log back in a few days later to see if you got it and confirm. 13. The Brandt Group - Restaurants. CO, ID, MT, OR, WA, WY only. Great shops with generous reimbursements and friendly staff. 14. Corporate Research Intl. - Retail, Delivery Pizza. Nationwide US and Canada. The popular teenage clothier shop and pizza shops have really easy forms so it is worth the time to certify. The other shops seem like too much time/effort. These shops go quick and rarely make it to email notifications. 15. Dunlap Enterprises - CA, OK only. 16. Mystery Guest - Restaurant. US only - Every 2-3 months they post $50 shops to a popular, higher end restaurant. 17. Sinclair Customer Metrics - Retail shops. Nationwide, US only. I pick up several of these shops every month. They are great about emailing when new shops are posted. 18. Second to None - Coffee, Electronics, Donuts. Nationwide, US and Canada. 19. Nationwide Services - Restaurant. Nationwide in US only (none in ID or UT). 20. Reality Check - Grocery, Casinos. Western US only. The $20 grocery shops are great! I find companies to sign up with through Jobslinger, Mystery Shop Forum, and a list on Slickdeals. Good luck with your shopping! Let me know if you have any questions. 6. Service Intelligence - Quick Serve Restaurants, Fast Food, Retail, Gas Stations. Once I did a sales pitch review of a local community college that paid $162 (for about 4 hours of my time). Nationwide in US and Canada. I have liked most jobs with this company, but I don't do the maternity store shop because I always overspend. 7. Trendsource (MSI Services) - Fast food, Ice Cream, Grocery Stores. Nationwide in US, a very very few in Canada. Their shops go quick, so check early and often. I have done the $27 grocery store shop twice, and probably won't again. 8. Beyond Hello - Optometrists, Travel Centers. Nationwide and many in Canada. I got my current glasses with this shop- however, I only recommend doing it if you have insurance because the $125 reimbursement won't cover everything. 9. IntelliShop - Travel Centers, Oil Changes, Assorted. Nationwide (as of today 4000 shops in US) and some in Canada (~ 200). I have never completed a shop with them, but a commenter, Digna of Autumn Blues Reviews, recommends them. 10. AboutFace - Cosmetics, Auto Supply. Nationwide, US only. In my opinion, avoid the Chinese shops (too small a reimbursement). 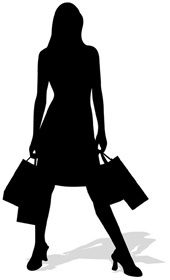 Check back tomorrow for the final installment of best mystery shopping companies to work for! Is Mystery Shopping Worth it? Amanda asked if mystery shopping takes a lot of effort. The answer is- YES. Some companies will make you jump through multiple hoops for the privilege of requesting a time-consuming shop with little reimbursement. Other companies may make the forms very complicated and send your reports back for revisions multiple times for obscure details. Still worse, some companies are known for creating excuses to avoid payment. Those are the companies to avoid! The companies I am listing here I have personally worked with and have found to be reputable. Before signing up with a company you haven't heard of before, do some research. 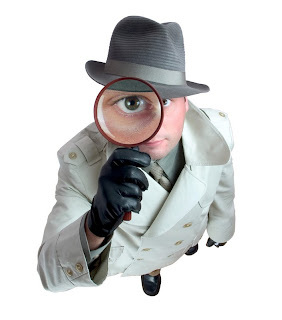 Mystery Shop Forum is a great resources for checking out companies. Ben ordered Ribeye & Ribs - Yum! 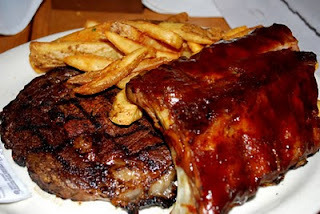 Ben and I went to a local steakhouse for dinner on Friday. It was our 5th time performing this shop, so I scanned the guidelines beforehand to make sure there were no changes. During dinner, I took down some notes and times on my cell phone. For the most part, though, I was able to enjoy the dinner and conversation with my husband while keeping an eye on the service and timings. After, it took me 45 minutes to fill out the report - a little longer than usual because the service was lacking and that required explanation in the comments. So, for about an hour of work we enjoyed a dinner out. Yesterday, we had lunch at a fast food place that we shop several times a month. I am so used to this report it takes me only about 20 minutes to fill out. For dinner we went to a nice local pizzeria with a $50 reimbursement. The report took me about 40 minutes to fill out. Basically, the first time you do a shop it will not seem worth the time. Just think of it as an investment. As you begin to find the good assignments and repeat them again and again, it will be a much better deal! I have had some bad shop and report experiences, and I've had some great ones. Try some out- make note of the ones that work and the ones that don't. For us, eating out isn't in the budget unless it is a mystery shop, so I'm happy to put in the work. There are tons of mystery shopping companies out there. Avoid those that make you pay, and, if anyone sends you a cashiers check to cover your shop while you return the extra- run away! Here are some reputable companies that I work for. As part of my mystery shopping contractor agreement with the companies, I can't divulge what specific businesses they shop, so I'll give general ideas. 1. Market Force - Fast food, office supply stores. Nationwide. I have done dozens of shops for this company, they pay regularly and have fair reimbursements for most shops. 2. Certified Field Associates - Movies, merchandising. Nationwide. A division of Market Force. I love the trailer check assignments, very easy and most of the time you can stay and watch the new film. Movie assignments are generally posted on Wednesday, and go fairly quickly so rarely are email notifications sent. I would not recommend the merchandising assignments as $8/hr is much too low when you add in drive and prep time. 3. A Closer Look - Restaurants, Hotels. Most states (not in Idaho, and I miss is soooo much!) Generous reimbursements. They rarely send email notifications, so check towards the end of the month for the next month's assignments. 4. GameFilm Consultants - Restaurants (Steakhouses! I'm going to one tonight, yum yum! ), Oil Changes. Nationwide. Fair reimbursements. Good about sending out emails when new shops are posted. 5. Kern Scheduling - Varies. This is actually a scheduling company- they post jobs from a great variety of mystery shopping companies. Nationwide. Typically have jobs that are difficult to fill (aka not as fun/rewarding to do), but it is worth signing up for so you can find more companies that have jobs in your area. As I said yesterday, I'm signed up for well over 30 companies. These are my top five, check back tomorrow for five more great companies to work for! My first exposure to mystery shopping was my parents taking us kids out to fancy restaurants as secret shoppers. We later moved to Indiana, where the restaurants weren't quite as fancy, and my parents quit "shopping". Always a lover of things free, I decided to get into shopping after moving to Provo, UT to attend BYU. Online, though, mystery shopping has morphed into something much different than my parents faced! It is easy to find companies, but difficult to find legitimate ones with local jobs. For that reason, I will be posting some of the tips and tricks I've learned over the 6 years I've been doing this, as well as some of the best companies I've found to work for. First, some basic guidelines for beginners. #1: Never Pay to Shop. If a company asks you to pay for access to shops, it is a fraud. #2: Adjust your expectations. 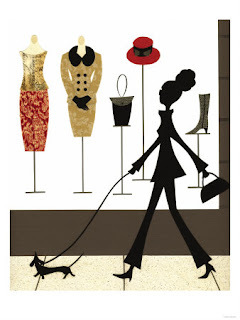 Mystery shopping is not a way to earn money. A good job will give an ample reimbursement and then a small fee that covers your gas, printing paperwork, and your time filling out the report. Many jobs will just pay a small fee and smaller reimbursement. Very rarely will your time be compensated more than $8/hr. For this reason, I only sign up for jobs that I would love to do anyway (going to a movie, restaurant, or shopping at a favorite store) or that have a large bonus attached. #3: Get organized. As you apply for companies, keep a list (I use a Google Word Document so I have easy access wherever I am). This is important to do as you will likely need to sign up for several companies (I am signed up with about 30) in order to find and get the jobs you want. ** Anytime you see a job posted, log the date. Chances are they will post the job around the same time next month. Log in at that time to get first pick. *** Frequently, companies will assign you a username and password. Keep it written down right by your link to log in and you are ready to go. #4: Check early, check often. Sometimes companies will send out email notifications when jobs are posted in your area. Most won't. It is a pain, but every week or so go through your list and check each job board. By taking notes when you find jobs, you'll learn when the jobs you like get posted. Those are your basic steps to getting started. Stay tuned tomorrow to learn how to find companies to sign up with and a list of my favorites. Let me know if you have any questions!